Legal systems around the world vary widely in terms of how they deal with the transfer of and security interests in receivables. The aim of this book is to help international financiers and lawyers in relevant markets in their practice of international receivables financing. Substantively, this book analyses three types of receivables financing transactions, ie outright transfer, security transfer and security interests. 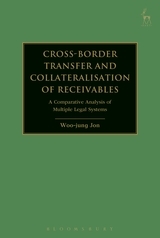 This book covers comprehensive comparison and analysis of the laws on the transfer of and security interests in receivables of fifteen major jurisdictions, encompassing common law jurisdictions, Roman–Germanic jurisdictions and French–Napoleonic jurisdictions, as well as relevant EU Directives. To be more specific, this book compares and analyses the relevant legal systems of the US, Canada, New Zealand, Australia, Korea, Japan, France, Belgium, England, Hong Kong, Singapore, China, Germany, Austria and the Netherlands. Furthermore, in order to analyse those legal systems from the international perspective, this book compares relevant international conventions; it also proposes to establish an international registration system for the transfer of and security interests in receivables. Woo-jung Jon is Doctor of Philosophy in Law, Faculty of Law, University of Oxford.